The world of the first Jesus followers was a world of “us and them.” The Scriptures present this first of all as the language of the people of God, Israelites and eventually Jews, who knew the rest as the “nations,” or “Gentiles.” Of course, Greeks and Romans also saw the rest of humanity as “barbarians,” thus underlining an ancient and universal human need to differentiate one’s own community from the Other. So, as the Jesus movement took shape and spread, among its central questions was the question of who was “with us” and who was not. From Jesus’ own comments to his disciples who observed others doing miracles (Mark 9:38-40) to the Antioch debate about who could eat with whom (Galatians 2), to the later New Testament fears about false prophets, Christians have worried that in some way their identity and their witness might be hindered if they were in the wrong company. At the same time, the earliest evidence also demonstrates a strong desire for communion among others of “like precious faith” (2 Peter 1:1, KJV): both those who know each other, and those who are unfamiliar with but aware of sisters and brothers living across the political, social, and economic barriers that divide human communities. Thus the sending and receiving of greetings by letter and the welcome of itinerant prophets and teachers also have shaped the Jesus movement from New Testament times. While many ecumenical (more or less) councils, creeds, symbols and confessions, and new movements have emerged among Christians in the centuries since then, the reflections in this article flow out of the ancient questions noted above. For the Brethren in Christ are little different from other groups of Christians down through the centuries who have worried about and cared deeply about to whom they belong and of whom they should beware. 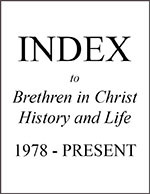 The twentieth century choice to name “Brethren in Christ identity” as deliberately variegated allowed some church members to find a sense of home among other descendants of the Anabaptists, while others consequently viewed this strand of their identity more guardedly.2 In so doing, the Brethren in Christ are no different from other Anabaptist-related groups. Sixteenth-century Anabaptists debated and practiced marital shunning; in the early twentieth century, it took much persuasion for relief committees from different Mennonite conferences to agree to work together in response to the appeal for aid from Mennonites in Russia, leading to the formation of Mennonite Central Committee. The reflection that follows is primarily personal in character, but draws on early General Conference records of the beginnings of the Brethren in Christ relationship with Mennonite World Conference (MWC); the perspectives visible in the work of denominational historian C. O. Wittlinger; snapshots of Brethren in Christ participation in particular MWC assemblies as found in the Evangelical Visitor; and insights from my father, J. Wilmer Heisey, whose wholehearted engagement with MWC provided the foundation for my own. I hope both to show that many historical questions remain to be addressed regarding this familial interaction, and to note the benefits and questions for the Brethren in Christ should they chose to continue such involvement. Space, time, and research limitations did not allow me to carry out a careful reading of General Conference and Visitor reports on all of the following assemblies. However, I opened a window in 1972, the year that my father first attended an assembly in Curitiba, Brazil. This gathering also represented the first time that MWC met in a location other than Canada, the United States or countries in Europe. A condensation of the keynote address by MWC president Erland Waltner was reprinted, a photograph of the six Brethren in Christ participants was included, and their contributions were noted: Bishop Philemon Khumalo of (then) Rhodesia “offered one of the prayers at the historic communion service” and read a paper to the Work Group on Peace. (It is likely that Khumalo was selected for the latter task precisely because of the situation in his home country, at that time under white minority rule and facing a rising military independence movement). Asao Nishimura of Japan also participated in the Peace group. U.S. Bishop Alvin Burkholder, the Brethren in Christ delegate to the MWC presidium, was “active in the planning of the conference and was leader of the Work Group on ‘Stewardship,’” and Wilmer Heisey participated in the Work Group on Missions. Hem Paul, an Indian BIC leader, represented his country on the presidium. The 1990 assembly of MWC, held in Winnipeg, Manitoba, provided an opportunity for my husband Paul Longacre and me to drive with my parents to the gathering. While I had attended the 1978 and 1984 assemblies, it was in 1990 that I began to gather a stronger sense of the meaning of the “communion” that seemed to be sought by those who participated. This sense was shaped as much by riding the buses to and from assembly locations as any particular part of the program. In particular, I recall the moment of joy when my mother Velma spotted her Cuban friend and correspondent, Juana Garcia, who had for years led the isolated little band of Brethren in Christ in Cuba, on one of those bus rides. The Visitor coverage again focused first of all on the related gathering of the International Brethren in Christ Fellowship, which the editor described in his comments as “a touch of heaven.”13 This language has come to define many persons’ descriptions of what happens at an MWC assembly—sharing food, conversation, listening to preaching and Bible studies in different languages, singing the songs of peoples from many places. Without an actual survey, I am confident that reporting from MWC assemblies in not only Brethren in Christ but many other Mennonite journals have shared this celestial metaphor. In his concluding editorial in the same issue, Glen Pierce also asked a question, however, that has become more and more important, both within the Brethren in Christ family around the world as well as across the Mennonite World Conference family. Is fellowship enough?14 The first President of Mennonite World Conference from the global South, Million Belete of Ethiopia, had been elected after the Curitiba gathering. The inclusion of more and more representatives from a growing number of churches in the global South had created the need for a travel fund to help cover the costs of getting to the gatherings. Some church leaders from global south, led by Mesach Krisetya of Indonesia, who long served on the MWC executive committee and became president in 1997, had begun to articulate a clear and sharp call for new kinds of relationships among this family of churches, more formal and mutual relationships that would share financial and other kinds of accountability. This challenge has been at the forefront of MWC’s work and life in the twenty-five years since the Winnipeg assembly. Some of its significance has been that MWC’s development has taken place as mission agencies of its member churches in the North, including the Brethren in Christ, have been shifting, and at times loosening their connections to sister churches in the South. Some of this move has come from strategies that seek to foster independence and a desire to avoid mother-daughter metaphors. At the same time, the reality that the vast bulk of financial resources for church programming are still held in the North, and that sisterly-brother connections have been weakened, have been keenly felt among Southern churches. MWC has faced this reality by designing a budget based on a “fair share” model, where member churches contribute according to their own economic contexts. In reality, only a few MWC member churches in Canada and Europe have ever met the “fair share” goal. But assembly attenders have come to accept that those from U.S., Canada and Europe will pay higher assembly registration fees than those from other parts of the world. My own formal engagement with MWC began with a volunteer role organizing a consultation on theological education held in conjunction with the 1997 MWC assembly in Calcutta. In the process I began to recognize much more keenly what a shoestring operation MWC was, how heavily it depended on volunteers, a small cluster of “friends” who had caught “the assembly bug,” and the support of Mennonite Central Committee, the one Anabaptist-related agency in the global North that is also inter-Anabaptist in character. I learned about the politics of covering bases—enough women, youth, and representatives of small member churches on the program, and the challenges of taking visions and wonderful fellowship from large events forward into ongoing relationships and even structures that could work on matters of concern to member churches. In planning the program for the 1997 Consultation on Theological Education on Five Continents, I was careful to assure a Brethren in Christ leader among the respondents. Bruce Khumalo of Zimbabwe, then principal of Ekuphileni Bible Institute, responded to the presentation on formal theological education as located between the center and the boundaries of the churches.15 In 2015 as we move toward Assembly 16 in Harrisburg, Pennsylvania, little progress has been made on strengthening sharing and interactions among Anabaptist-related theological and other educational institutions around the world. In 1998 I was asked to serve as one of the three delegates to the MWC General Council from Mennonite Church USA, where my active membership has been held since my marriage. When the General Council next met in 2000 in Guatemala City, the nominating committee approached me at the meeting itself to ask if I would allow my name to be on the ballot for president-elect. No one, myself included, expected that I would be elected, and the account of that event is a story for another venue. But after the election, as the news releases were being prepared, I approached the North American Brethren in Christ delegates to ask if they would object to my listing my ongoing membership in the Brethren in Christ as well (since I had maintained a membership in my home Brethren in Christ congregation in Pennsylvania through the years). While I’m quite sure denominational polity at that time could have questioned such a label, the delegates readily assented, and through the rest of my years of service to MWC, through 2009, I gladly identified as Brethren in Christ as well as Mennonite. Danisa Ndlovu, long-time bishop of the Brethren in Christ Church in Zimbabwe, was elected as vice president in 2003. We enjoyed a very fruitful partnership during my presidency, and I was delighted when Ndlovu became president at the end of my term. Thus in a very visible way, Brethren in Christ members have played key roles in MWC for more than fifteen years. In addition, in a very public way, the Brethren in Christ were MWC when the church in Zimbabwe hosted the assembly there in 2003. I recall, however, the struggles that assembly organizers, and some engaged Brethren in Christ friends had, explaining to other Brethren in Christ members why this meeting was important and why they should consider attending. From time to time in the years since I have left my active responsibilities, I have continued to be asked to advocate for MWC in denominational circles. It is not that the Brethren in Christ response is so unusual, at least not in Canada and the U.S. Other smaller member churches have also tended to be shy about, or simply unaware of, the possibilities open to them through active engagement in MWC. Nancy R. Heisey teaches in the Religion and Bible Department at Eastern Mennonite University, Harrisonburg, Va. She served six years as president of Mennonite World Conference. Read more articles by Nancy R. Heisey.